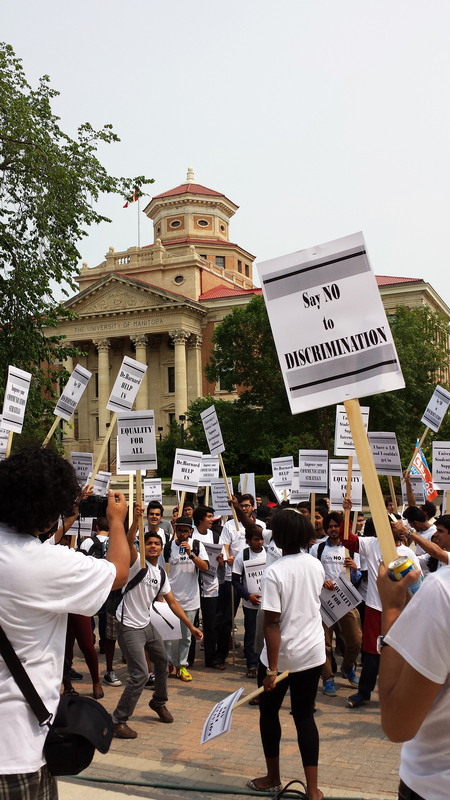 A group of University of Manitoba students and supporters protested on July 17 against what they called discriminatory admissions policies at the university’s faculty of engineering. Demonstrators were protesting the discrepancy between admissions cut-offs for international students and domestic students. Domestic students required a minimum 2.94 GPA to be considered for the faculty’s civil engineering stream in the 2014-2015 academic year, while international students required a minimum 4.13 GPA. Civil engineering has the largest differential between domestic and international students but similar differences exist for the biosystems, computer, electrical, and mechanical streams. Representatives of the Canadian Federation of Students, including CFS-Manitoba chairperson Zach Fleisher, were on hand to offer support to protesters. Astitwa Thapa, president of the Nepali Students’ Association, was one such student. Thapa, a student in the faculty of environment, earth, and resources, helped organize the protest and has been calling on the faculty of engineering to end what he calls a discriminatory policy. He characterizes the high cut-off rate for international students as a surprise for many international students expecting to attend in the 2014-2015 academic year. “You’re entitled to make a change in the policy but you’re not entitled to not share this with the students and ruin their lives,” Thapa told the Manitoban. But faculty of engineering dean Jonathan Beddoes said no changes have been made to the faculty’s admissions policy and that the faculty has actually increased its number of admitted international students over the past several years. The faculty of engineering aims to have 12 to 15 per cent of spots set aside for international students. In this year’s cohort that number is 13.7 per cent with 48 of the 348 admitted to the faculty are international students. That figure puts the U of M on par with the national average of 13.7 per cent for engineering faculties and above the University Strategic Enrolment Plan’s stated goal of 10 per cent, Beddoes said. Thapa remains unsatisfied. He said that under existing policies, international students are being turned away unexpectedly. The policy of limiting numbers of international students is not specific to the faculty of engineering. Although Thapa thinks international students applying to the faculty of engineering were treated unfairly, he was aware the faculty has a policy that favours charging international students more than Canadians. Despite the tension between the international students and the faculty of engineering, Fleisher said he believes there are solutions.